Tee hee! You must teach me to knit sometime. Wasn't it the great October knitting break? November seems to be looking very productive already. You could take a picture of then new washcloth in your new bathroom. We haven't seen that yet have we? I'm pretty sure not. Do you have pictures on flickr? I'm going now to see. Ha! Your so funny! Bear, get it?! Hahahahaha! I agree with Autum, where are those completed bathroom makeover pictures? lovely square bear, and yes, i too, am confused. i thought oct was knitting break month, not november? My wording was unclear - because I did end up taking a break from knitting for most of the month of October, didn't I? Old bathroom pictures are up on Flickr - new bathroom pictures got put on hold b/c of exploding light fixture - which has now been replaced! Guess I know what I'm doing this weekend, hmmm? Hah! I can hardly 'bear' how funny you are!! Hehe! 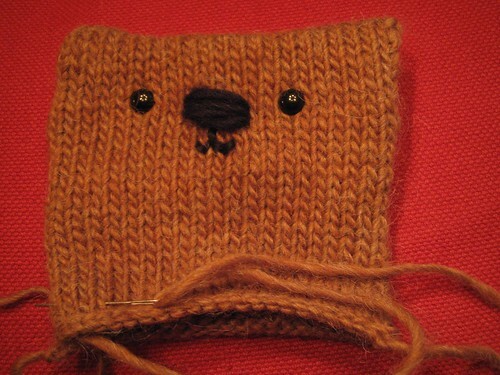 well i can't BEAR how cute the square bear is! That square bear is beary cute!